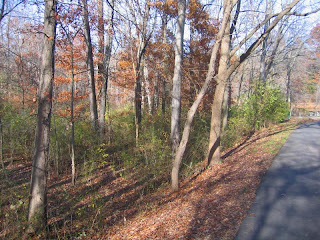 Even this late in the fall, some shrubs and trees announce their identities by the colors of their leaves. They can appear as if a child carefully colored in a number-coded landscape-- oaks and blackhaw Viburnums bronze, the Asian photinia a golden yellow that turned to dark brown in the hard frost. Here is a photo of Pettoranello Gardens, with native oaks bronze above a shrub layer of still-green exotic honeysuckles. The logic here is that the honeysuckles evolved in a milder climate on another continent, whereas plants native to America adapted to longer winters by dropping their leaves earlier. Just upstream of Mountain Lakes, the extent of exotic invasive shrubs is especially revealed this time of year, as the vistas open up. The pink of winged Euonymus has just fallen, but the invasion of honeysuckle shrubs can easily be tracked by their persistent green. The frost hit hard two nights ago, as the temperature dipped to the low 20s. A full moon shone down from so nearly straight above, and so bright on a cold snap night that even a town slicker took notice. 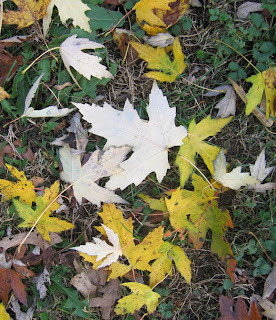 I went outside and in the stillness heard the floppy sound of Norway Maple leaves hitting the ground in a steady letting go. 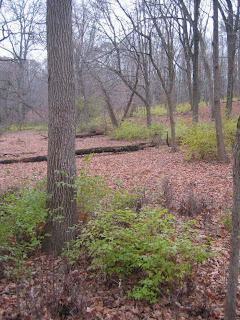 No other kind of tree was dropping its leaves--only the Norway Maples, still responding after centuries in America to cues and tempos learned long ago in distant lands. Today, an Indian Summer day, with brightly colored light filling the backyard, I tried to make myself still enough to watch leaves fall. The trees in my backyard are a mixed blessing. They obscure the sunsets and the vast sweep of the sky, but today they are offering their own endless permutations of beauty. 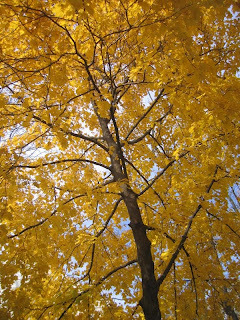 Each leaf, huddled in vaulted obscurity all summer long, has but one chance to show its personality. Gliding back to the ground from whence they came, the leaves of a silver maple tree slice through the air, each in its own way. Some are in a rush; others stretch the moment for all it's worth. Some spin fast, some slow, some descend in spirals tight or broad. Others glide like well-crafted paper airplanes, landing far afield. Each catches the light in this moment of distinction, these few seconds of quiet fame. As if they were dancers auditioning for a ballet that will be forever in the writing, I wish I could congratulate each one on its flight--its contribution to the beauty of an autumn day--before it fades beneath a shimmering shower of countless others. 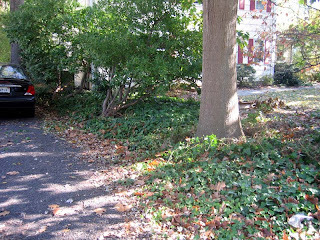 A typical scene along a property line, where English Ivy has taken over. Say you tire of its imperialistic ambitions and static green, but don't want to engage in a down and dirty tug of war (see previous post, 3/5/07). 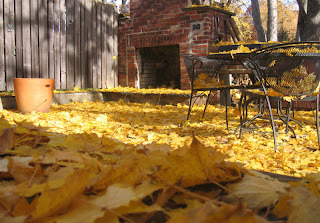 If it happens to be fall, and leaves are plentiful, it's a perfect time to do it in without hardly a pull. Enter that most versatile of substances, cardboard, easily requisitioned along curbsides. The bigger the pieces, the better. Some people use newspapers, but many layers are needed, they decompose too fast, and their small size makes for many more cracks where the ivy could push up. Tools needed are shown. The principal behind this approach involves the need of plants for energy. Cut off sunlight for months at a time, and even a powerful-looking patch of ivy will fade back into the ground. With a constant need to metabolize, and no new energy coming in, the ivy roots die of starvation. Use this approach only if there are no spring bulbs or other desired plants mixed in with the ivy. 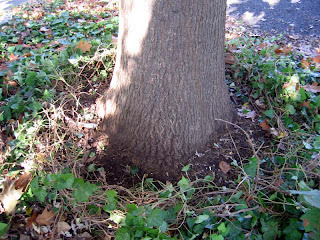 Begin by pulling the ivy away from trees and shrubs. If it's rained recently and the ground is soft, most stems pull easily out of the ground. Cut the stubborn ones with hand clippers. Also work along the edges of the patch, pulling the ivy back to reduce the area that needs to be covered. 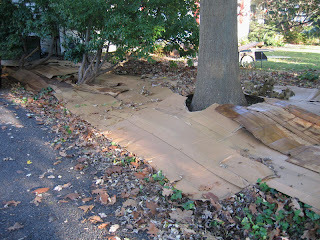 Then spread the cardboard, overlapping 6" to a foot to prevent any ivy from pushing up through gaps. 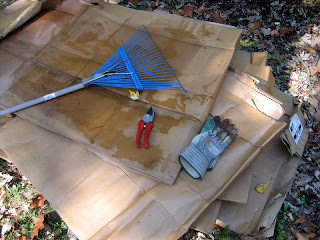 Where there are lots of shrubs to work around, and different sizes of cardboard to work with, it starts to feel like a jigsaw puzzle, finding the right piece to fit any particular spot. In these photos, the process is simplified because the shrubs are all in a line. Be sure to cover all the ivy, or sever connections between the areas covered and those that will remain exposed. 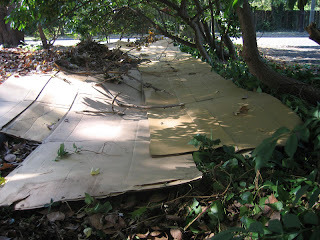 Otherwise, the ivy that doesn't get covered will continue sending energy to the ivy under the cardboard. 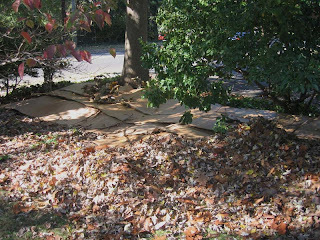 Now it's time to cover the whole thing up with leaves, giving the impression that there is no ivy or cardboard. Over, say, two to six months, the ivy will give up the ghost, the cardboard will decompose and the area can be planted with wildflowers, bulbs, what have you. In the meantime, the leaves provide a quiet, woodsy feel. This whole project took about two hours.